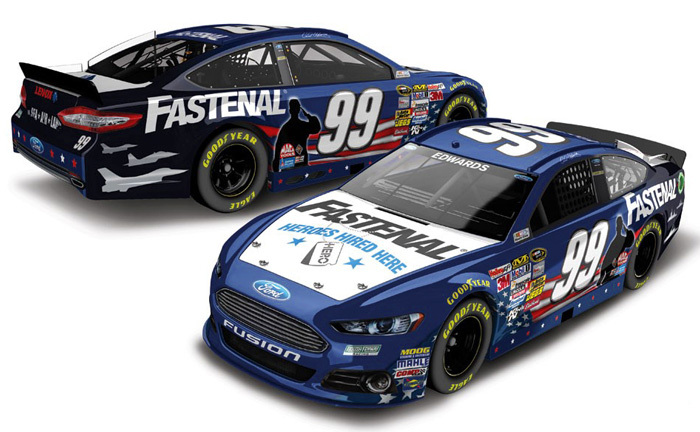 The "NASCAR: An American Salute" program will bring together the sport's biggest names to show appreciation and thanks to our military for their sacrifice and dedication in protecting our country and our freedom! 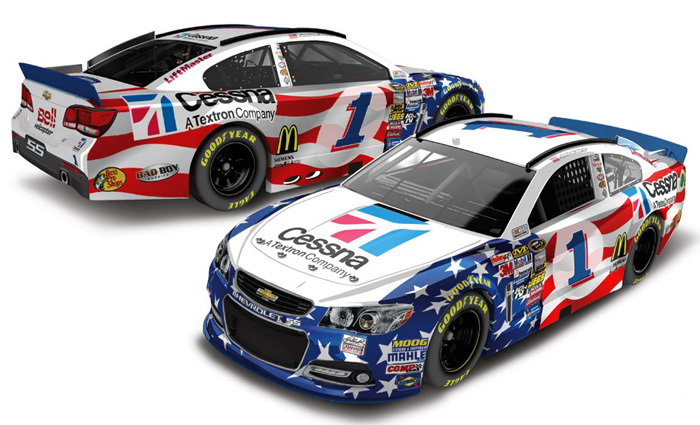 Beginning with the Coca-Cola 600 at Charlotte Motor Speedway on May 26th and again at the Coke Zero 400 on July 6th at Daytona International Speedway, the sport's most popular drivers will run special patriotic paint schemes that salute our active troops and honor our veterans! 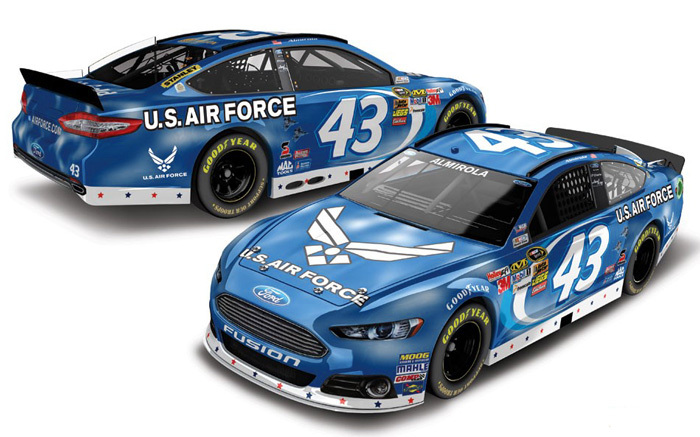 2013 Aric Almirola #43 U.S. Air Force / NASCAR: An American Salute / Ford Fusion NASCAR diecast, by Action. The Richard Petty Motorsports #43 NASCAR: An American Salute Ford was raced by Aric Almirola in the NASCAR Sprint Cup, Coca-Cola 600 at Charlotte Motor Speedway on 5/26 and Coke Zero 400 at Daytona International Speedway on 7/6/13. 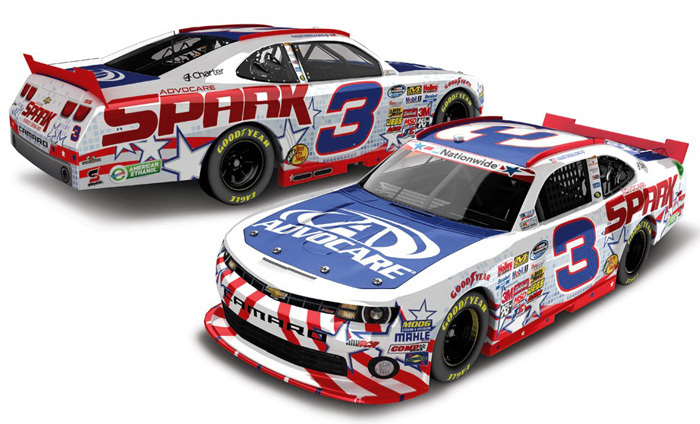 2013 Austin Dillon #3 AdvoCare Spark / NASCAR: An American Salute / Chevrolet Camaro NASCAR diecast, by Action. The Richard Childress Racing #3 NASCAR: An American Salute Chevrolet Camaro was raced by Austin Dillon in the NASCAR Nationwide Series, Subway Firecracker 250 at Daytona International Speedway on July 5, 2013. 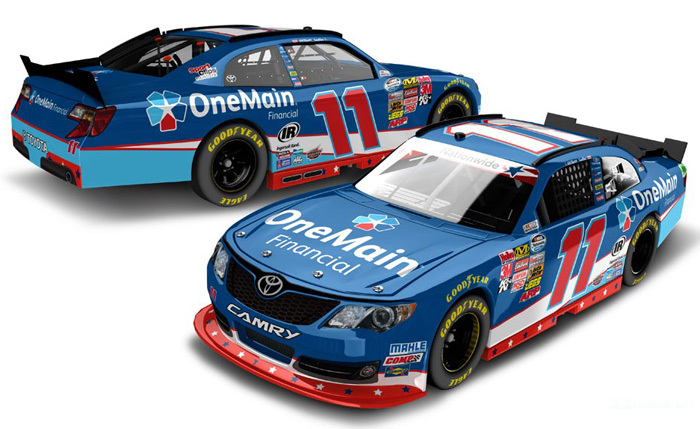 2013 Elliott Sadler #11 OneMain Financial / NASCAR: An American Salute / Toyota Camry NASCAR diecast, by Action. The Joe Gibbs Racing #11 NASCAR: An American Salute Toyota was raced by Elliott Sadler in the NASCAR Nationwide Series, History 300 at Charlotte Motor Speedway on May 25, 2013. 2013 Elliott Sadler #11 Sport Clips / NASCAR: An American Salute / Toyota Camry NASCAR diecast, by Action. The Joe Gibbs Racing #11 NASCAR: An American Salute Toyota was raced by Elliott Sadler in the NASCAR Nationwide Series, Subway Firecracker 250 at Daytona International Speedway on July 5, 2013. 2013 Brian Scott #2 Rain-X / Chevrolet Camaro NASCAR diecast, by Action. The Richard Childress Racing #2 NASCAR: An American Salute Chevrolet Camaro was raced by Brian Scott in the NASCAR Nationwide Series, Subway Firecracker 250 at Daytona International Speedway on July 5, 2013. Autographed - This diecast car was autographed by Regan Smith, on the windshield in Silver. Includes an Action Racing Collectables certificate of authenticity and JR Motorsports hologram. 2013 Regan Smith #7 TaxSlayer / NASCAR: An American Salute / Chevrolet Camaro NASCAR diecast, by Action. The JR Motorsports #7 NASCAR: An American Salute Chevrolet Camaro was raced by Regan Smith in the NASCAR Nationwide Series, History 300 at Charlotte Motor Speedway on May 25, 2013. 2013 Ricky Stenhouse Jr #17 Fastenal / NASCAR: An American Salute / Ford Fusion NASCAR diecast, by Action. The Roush Fenway Racing #17 NASCAR: An American Salute Ford was raced by Ricky Stenhouse Jr in the NASCAR Sprint Cup, Coca-Cola 600 at Charlotte Motor Speedway on May 26, 2013.